I was recently contacted by members of Exeter Palestine Solidarity Campaign and Exeter Socialists about an invitation which was extended to the well-known anti-Semite Gilad Atzmon, to speak at their event. I had previously resisted the entreaties of Atzmon groupies who were so dazzled by the defence of Atzmon by Roy Ratcliffe that they wanted me to reply! However I am happy to pen a short reply to his nonsense (which you can see in 2 parts of Rizzo’s Palestine Think Tank site). You can get a flavour of Shamir’s politics when he wrote to Lee Barnes, legal advisor to the BNP accusing them of being too pro-Jewish!! We can therefore judge Rattcliffe’s ‘trade union’ and ‘humanist’ pedigree by the company he keeps. Ratcliffe has produced a turgid 30 page article defending his hero. People will understand if I don’t reply in mind at similar length. There can be little doubt about Israel Shamir’s fascist politics. Yet Atzmon first came into the picture when he wrote an article ‘The Protocols of the Elders of London’ which bases itself on the notorious anti-Semitic Czarist forgery, the Protocols of the Elders of Zion. The only difference between Atzmon and Hitler is that for Hitler the fact that they were true meant they were authentic, whereas for Atzmon it is irrelevant if they are a forgery, because clearly they are true! A distinction without a difference. Atzmon’s ‘Protocols’ article was produced because we had criticised a tiny group Deir Yassin Remembered which had as its advisor, Shamir, and those British Director Paul Eisen was another holocaust denier. Atzmon described Shamir to me as a ‘unique and advanced thinker’ so it is clear where Atzmon is coming from. Just as he described Paul Eisen’s Holocaust Wars, a full blooded defence of German neo-Nazi Ernst Zundel and holocaust denial as a ‘great text’. Atzmon isn’t a fascist but he is happy to defend those who are. In fact this timelessness of anti-Semitism is a key part of Zionist ideology. But why does he have nothing to say about the following, taken from Atzmon’s ‘On anti-Semitism’ article? But very few workers were taken in. The vote for the SPD and KPD in 1932 was as large as that in 1920. Indeed between July and November 1932 the Nazi vote decreased by 2 million whereas the KPD increased theirs to 6 million and the SPD 7 million. Clearly German workers weren’t as stupid or gullible as Atzmon and his sycophantic supporters like Ratcliffe. Zionism believed that anti-Semitism was an incurable disease If you couldn’t cure it, why fight it. This was the main reason why the Zionist movement collaborated with Nazism. Zionism came to terms with anti-Semitism because they both subscribed to the same outlook - Jews didn't belong anywhere but Palestine. Anyone who is even vaguely aware of the history of Zionism knows of the ideological and political symmetry between Zionism and anti-Semitism. Who welcomed Herzl’s ‘Der Judenstaat’ (The Jewish State) pamphlet if not people like Eduard Drumont, the key anti-Semitic journalist in France who favourably reviewed it in his daily, La Libre Parole. This really is nonsense and shows he understands nothing of that which he writes about. Was IG Farben or the other private firms who operated in Auschwitz & Monowitz collective capitalists or private enterprise? Was IBM nationalised in Germany? It is a myth that German Fascism, still less Italian or Spanish fascism, were examples of collective capitalism. Unfortunately Ratcliffe mistakes propaganda for reality. Likewise fascism (Italy/Spain) wasn’t particularly racist until in Italy the influence of Hitler was felt in 1938. ‘"Finally, I emphatically believe that the Nazi holocaust should be studied. Yet one cannot learn anything substantive until and unless the Holocaust industry is shut down. Meaningful historical inquiry practically requires that comparisons be made." Ratcliffe states that he doesn’t believe Israel is fascist. Neither Roland Rance or myself said otherwise, so he is tilting at windmills. It was Atzmon who posited this as some kind of explanation for Israel. Ratcliffe argues that ‘Zionism is a continuation of Jewishness’ but this is a false debate. Jewish identity, not the vague and essentialist ‘Jewishness’ which is a codeword for ‘Jewish race’ has changed many times historically. The primary Jewish identity today is indeed Zionistic, but there are also anti-racist and anti-Zionist Jewish identities. It is Atzmon who argues that to be Jewish is to be a Zionist. ‘by fighting Zionism in the name of their Jewish identity they approve Zionism. They must fail to realise that their form of resistance contributes to the labelling of the entire Jewish people as war criminals…. The whole point of course is that anti-Zionists don’t accept that Jewish identity is a ‘national definition’. Only Zionists, Ratcliffe and Atzmon make such an equation. Ratcliffe sees Zionism as a continuation of rabbinical Zionism. In fact the Jewish Orthodox, of which Neturei Karta are the only remnants today, opposed Zionism. It is the successes of Zionism and the way it borrowed the rhetoric of religion for political purposes which enabled it to create an entirely new tradition. Religious Zionism uses the chauvinism of Rabbinical Zionism towards non-Jews, a chauvinism which is typical of all religions, but for the purposes of a new political project. Ratcliffe takes Roland Rance and myself to task for saying that what is important about Israel is not its ‘Jewish’ nature but its Zionism. But that’s like criticising the Loyalists of Ulster for being Protestant. ‘A Protestant State for a Protestant People’. But the fact that the Orange State was Protestant didn’t define its character. It is quite possible to imagine the roles of Catholics and Protestants being reversed but the nature of the 6 Counties remaining unchanged. Socialists don’t mistake the ideological justification of the enemy for reality. Zionism would have been racist whatever the justification, because it was colonialist and supported by imperialism. That is what lies at the heart of Zionist racism in Israel today, not the fact that Maimonedes was a chauvinist 900 years ago! Not so. I have no idea whether Ratcliffe agrees with everything Eisen and Shamir has produced. But the fact that he has defended the racist, reactionary outpourings of Atzmon gives us a clue! But for Roy Ratcliffe it is clear that support for the small number of anti-Semites and racists around the Palestine Solidarity movement is more important than Palestine Solidarity itself. And that is of course another characteristic of the Atzmon/Rizzo brigade, who earlier this year posted a ‘petition’ supporting themselves – ‘outstanding personalities’ they called themselves when we criticised them!! Ratcliffe states that ‘We need to bear in mind that truthful criticism can be hurtful without necessarily being phobic’. That is of course true, but when Atzmon blames the largely anti-Zionist Jews of Eastern Europe, most of whom voted for the anti-Zionist Bund (Jewish Workers Party of Russia, Lithuania & Poland) for the Holocaust then this isn’t about ‘truthful criticism’ but blaming the victims of the Nazi holocaust, for their own demise, since they did not ‘internalise the real meaning’ of the conditions that led to their murder. Atzmon, in the historical debate between the anti-Zionist Bund and Zionism, attacks the latter. Of course there are some who are impressed by this gibberish, a total failure to understand the Bund and the class struggle within and without the working class Jews of the Pale of Settlement. But whereas the Bund organised self-defence against the pogroms and fought alongside Russian and Polish workers, the Zionists that Atzmon sees as ‘clever’ allied with the Czarist autocracy that his friend Israel Shamir looks back on with fond admiration. This is the creature that Roy Ratcliffe defends. Ratcliffe points out that the Jewish Orthodox also holds the murdered Jews of Eastern Europe were to blame for sinning against the tenets of Judaism. That is true, which is why their views are so abhorrent and reactionary. But religious fundamentalists always blame the most catastrophic events on people having forsaken their religion. It has little political meaning. Those who blame the Jews politically for the holocaust are a different kettle of fish or are we to accept now that Atzmon too is a religious fundamentalist? Again who is to disagree. Religion has always acted as an ideological and political legitimator of oppression and colonial barbarities, but that doesn’t therefore mean that the Jewish holy books are any more chauvinist than those of the Christian/Muslim/Budhist religions. Incidentally the ideas of the Torah are only racist in a modern capitalist sense, not in their pre-capitalist mould. Unfortunately logic is not Ratcliffe’s main attribute. Obviously if Israel wasn’t Zionist then it would be unlikely to be a Jewish State. But the question is where the racist and exclusivist ethnic nature of the Israeli state came from. Was it something to do with the peculiar nature of the Jewish religion or did it take its cue from the settler colonial nature of the Zionist project? Ratcliffe doesn’t answer this because, at best, he is totally confused. Ratcliffe also cannot understand why we criticise Atzmon for his open espousal and support for Eisen, Shamir and his alter ego ‘knuckles’ – an open holocaust denier. Well the reason is quite simple. Support for anti-Semitism plays into the hands of Zionists and hence benefits only the oppressors of the Palestinians. What it doesn’t do is affect Jews for whom anti-Semitism today is a largely marginal prejudice. We oppose Atzmon’s anti-Semitic politics because we support the Palestinians and don’t see why the oversized Atzmon ego and the pathetic efforts of those dazzled by this verbally incontinent jazz musician should be allowed to get in the way of Palestinian solidarity. This is interesting because none of the above organisations were socialist. Mapai never even claimed to be socialist. The form of socialism, i.e. collective organisation, was adopted in order to pursue colonial objectives. Just as the Boer Trekkers and the American colonists engaged in collective colonialism at different times. How could the Jewish only kibbutzim have ever been socialist when they excluded the Palestinians? Mapai was set up (as an intelligent Zionist like Zeev Sternhall recognises in his Founding Myths of Zionism) as an anti-socialist organisation. Palestine Poale Zion was likewise never socialist and markedly diverged from its Polish counterpart (in Russia it had collapsed into the Bolshevik party since Jewish workers saw no need for this movement of the middle class when the working class movement saw of the anti-Semitic movements). That is why Ben-Gurion coined the slogan ‘From Class to Nation’. The purpose of organising the working class was to build Zionism not socialism. The reality is that Roy Ratcliffe takes 30 pages to pen a defence of Atzmon precisely because he doesn’t understand either the nature of Zionism or the critique of Atzmon himself. It is one of the hallmarks of Atzmon and his supporters that there is an inverse relationship between what they have to say and how long they take to say it! A packed meeting last night saw the setting up of the International Jewish Solidarity Network in Britain. Speakers included veteran Israeli anti-Zionist, Professor Moshe Machover and Hossam El-Hamalawy, and Egyptian journalist. It is gratifying to see the growth in the number of Jewish people taking a stand and coming out against Zionism and its murderous deeds. It gives the lie to the anti-Semitic Atzmon/Rizzo idea that to be Jewish and oppose Zionism is to be a Zionist! Speakers include: Hossam El-Hamalawy, Egyptian journalist, blogger and activist; Liliane Kaczerginski, IJSN member, based in Paris; Professor Moshe Machover, co-founder of Matzpen, an anti-Zionist Israeli organisation founded in 1962 and active until the 1980s; Daniel Machover, lawyer working to indict Israeli army officers for war crimes; Sue Blackwell, Birmingham University, prominent advocate of the academic boycott against Israel; Michael Kalmanovitz, IJSN UK; and others. Chair, Selma James, IJSN UK . Presenters will give some of the history of the region and resistance to Zionism and share a range of initiatives against the Zionist state of Israel including the vital boycott / divestment / sanctions movement, followed by discussion. For the past two years IJSN has been building an international network of anti-Zionist Jews to support existing and seed new Jewish anti-Zionist organizing in solidarity with Palestinian resistance. As with any other anti-imperialist struggle or struggle for social justice, working locally or even nationally is not enough. The enemy we face is international, and what we can do is limited unless we find ways to work together across boundaries and regions. We are building an international voice which challenges Zionism and its claim to speak on behalf of Jews worldwide. As an international force, we can contribute to the movement to defeat US-backed Israeli imperialism. This is from an article 'Worse than Apartheid' by Gideon Levy. He cites the editor-in-chief of the Sunday Times of South Africa, Mondli Makhanya, 38 thus. "When you observe from afar you know that things are bad, but you do not know how bad. Nothing can prepare you for the evil we have seen here. In a certain sense, it is worse, worse, worse than everything we endured. The level of the apartheid, the racism and the brutality are worse than the worst period of apartheid. "The apartheid regime viewed the blacks as inferior; I do not think the Israelis see the Palestinians as human beings at all. How can a human brain engineer this total separation, the separate roads, the checkpoints? What we went through was terrible, terrible, terrible - and yet there is no comparison. Here it is more terrible. We also knew that it would end one day; here there is no end in sight. The end of the tunnel is blacker than black. "Under apartheid, whites and blacks met in certain places. The Israelis and the Palestinians do not meet any longer at all. The separation is total. It seems to me that the Israelis would like the Palestinians to disappear. I thought they would feel right at home in the alleys of Balata refugee camp, the Casbah and the Hawara checkpoint. But they said there is no comparison: for them the Israeli occupation regime is worse than anything they knew under apartheid. This week, 21 human rights activists from South Africa visited Israel. Among them were members of Nelson Mandela's African National Congress; at least one of them took part in the armed struggle and at least two were jailed. There were two South African Supreme Court judges, a former deputy minister, members of Parliament, attorneys, writers and journalists. Blacks and whites, about half of them Jews who today are in conflict with attitudes of the conservative Jewish community in their country. Some of them have been here before; for others it was their first visit. For five days they paid an unconventional visit to Israel - without Sderot, the IDF and the Foreign Ministry (but with Yad Vashem, the Holocaust Memorial and a meeting with Supreme Court President Justice Dorit Beinisch. They spent most of their time in the occupied areas, where hardly any official guests go - places that are also shunned by most Israelis. On Monday they visited Nablus, the most imprisoned city in the West Bank. From Hawara to the Casbah, from the Casbah to Balata, from Joseph's Tomb to the monastery of Jacob's Well. They traveled from Jerusalem to Nablus via Highway 60, observing the imprisoned villages that have no access to the main road, and seeing the "roads for the natives," which pass under the main road. They saw and said nothing. There were no separate roads under apartheid. They went through the Hawara checkpoint mutely: they never had such barriers. Jody Kollapen, who was head of Lawyers for Human Rights in the apartheid regime, watches silently. He sees the "carousel" into which masses of people are jammed on their way to work, visit family or go to the hospital. Israeli peace activist Neta Golan, who lived for several years in the besieged city, explains that only 1 percent of the inhabitants are allowed to leave the city by car, and they are suspected of being collaborators with Israel. Nozizwe Madlala-Routledge, a former deputy minister of defense and of health and a current member of Parliament, a revered figure in her country, notices a sick person being taken through on a stretcher and is shocked. "To deprive people of humane medical care? You know, people die because of that," she says in a muted voice. The tour guides - Palestinian activists - explain that Nablus is closed off by six checkpoints. Until 2005, one of them was open. "The checkpoints are supposedly for security purposes, but anyone who wants to perpetrate an attack can pay NIS 10 for a taxi and travel by bypass roads, or walk through the hills. The real purpose is to make life hard for the inhabitants. The civilian population suffers," says Said Abu Hijla, a lecturer at Al-Najah University in the city. In the bus I get acquainted with my two neighbors: Andrew Feinstein, a son of Holocaust survivors who is married to a Muslim woman from Bangladesh and served six years as an MP for the ANC; and Nathan Gefen, who has a male Muslim partner and was a member of the right-wing Betar movement in his youth. Gefen is active on the Committee against AIDS in his AIDS-ravaged country. "Look left and right," the guide says through a loudspeaker, "on the top of every hill, on Gerizim and Ebal, is an Israeli army outpost that is watching us." Here are bullet holes in the wall of a school, there is Joseph's Tomb, guarded by a group of armed Palestinian policemen. Here there was a checkpoint, and this is where a woman passerby was shot to death two years ago. The government building that used to be here was bombed and destroyed by F-16 warplanes. A thousand residents of Nablus were killed in the second intifada, 90 of them in Operation Defensive Shield - more than in Jenin. Two weeks ago, on the day the Gaza Strip truce came into effect, Israel carried out its last two assassinations here for the time being. Last night the soldiers entered again and arrested people. It has been a long time since tourists visited here. There is something new: the numberless memorial posters that were pasted to the walls to commemorate the fallen have been replaced by marble monuments and metal plaques in every corner of the Casbah. "Don't throw paper into the toilet bowl, because we have a water shortage," the guests are told in the offices of the Casbah Popular Committee, located high in a spectacular old stone building. The former deputy minister takes a seat at the head of the table. Behind her are portraits of Yasser Arafat, Abu Jihad and Marwan Barghouti - the jailed Tanzim leader. Representatives of the Casbah residents describe the ordeals they face. Ninety percent of the children in the ancient neighborhood suffer from anemia and malnutrition, the economic situation is dire, the nightly incursions are continuing, and some of the inhabitants are not allowed to leave the city at all. We go out for a tour on the trail of devastation wrought by the IDF over the years. Edwin Cameron, a judge on the Supreme Court of Appeal, tells his hosts: "We came here lacking in knowledge and are thirsty to know. We are shocked by what we have seen until now. It is very clear to us that the situation here is intolerable." A poster pasted on an outside wall has a photograph of a man who spent 34 years in an Israeli prison. Mandela was incarcerated seven years less than that. One of the Jewish members of the delegation is prepared to say, though not for attribution, that the comparison with apartheid is very relevant and that the Israelis are even more efficient in implementing the separation-of-races regime than the South Africans were. If he were to say this publicly, he would be attacked by the members of the Jewish community, he says. Under a fig tree in the center of the Casbah one of the Palestinian activists explains: "The Israeli soldiers are cowards. That is why they created routes of movement with bulldozers. In doing so they killed three generations of one family, the Shubi family, with the bulldozers." Here is the stone monument to the family - grandfather, two aunts, mother and two children. The words "We will never forget, we will never forgive" are engraved on the stone. No less beautiful than the famed Paris cemetery of Pere-Lachaise, the central cemetery of Nablus rests in the shadow of a large grove of pine trees. Among the hundreds of headstones, those of the intifada victims stand out. Here is the fresh grave of a boy who was killed a few weeks ago at the Hawara checkpoint. The South Africans walk quietly between the graves, pausing at the grave of the mother of our guide, Abu Hijla. She was shot 15 times. "We promise you we will not surrender," her children wrote on the headstone of the woman who was known as "mother of the poor." Lunch is in a hotel in the city, and Madlala-Routledge speaks. "It is hard for me to describe what I am feeling. What I see here is worse than what we experienced. But I am encouraged to find that there are courageous people here. We want to support you in your struggle, by every possible means. There are quite a few Jews in our delegation, and we are very proud that they are the ones who brought us here. They are demonstrating their commitment to support you. In our country we were able to unite all the forces behind one struggle, and there were courageous whites, including Jews, who joined the struggle. I hope we will see more Israeli Jews joining your struggle." She was deputy defense minister from 1999 to 2004; in 1987 she served time in prison. Later, I asked her in what ways the situation here is worse than apartheid. "The absolute control of people's lives, the lack of freedom of movement, the army presence everywhere, the total separation and the extensive destruction we saw." Madlala-Routledge thinks that the struggle against the occupation is not succeeding here because of U.S. support for Israel - not the case with apartheid, which international sanctions helped destroy. Here, the racist ideology is also reinforced by religion, which was not the case in South Africa. "Talk about the 'promised land' and the 'chosen people' adds a religious dimension to racism which we did not have." Equally harsh are the remarks of the editor-in-chief of the Sunday Times of South Africa, Mondli Makhanya, 38. "When you observe from afar you know that things are bad, but you do not know how bad. Nothing can prepare you for the evil we have seen here. In a certain sense, it is worse, worse, worse than everything we endured. The level of the apartheid, the racism and the brutality are worse than the worst period of apartheid. "The apartheid regime viewed the blacks as inferior; I do not think the Israelis see the Palestinians as human beings at all. How can a human brain engineer this total separation, the separate roads, the checkpoints? What we went through was terrible, terrible, terrible - and yet there is no comparison. Here it is more terrible. We also knew that it would end one day; here there is no end in sight. The end of the tunnel is blacker than black. "Under apartheid, whites and blacks met in certain places. The Israelis and the Palestinians do not meet any longer at all. The separation is total. It seems to me that the Israelis would like the Palestinians to disappear. There was never anything like that in our case. The whites did not want the blacks to disappear. I saw the settlers in Silwan [in East Jerusalem] - people who want to expel other people from their place." Afterward we walk silently through the alleys of Balata, the largest refugee camp in the West Bank, a place that was designated 60 years ago to be a temporary haven for 5,000 refugees and is now inhabited by 26,000. In the dark alleys, which are about the width of a thin person, an oppressive silence prevailed. Everyone was immersed in his thoughts, and only the voice of the muezzin broke the stillness. 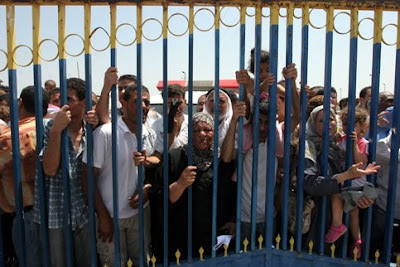 Palestinians wait to cross into Egypt at the Rafah Crossing in the southern Gaza Strip, 1 July, 2008. (Wissam Nassar/MaanImages) On Monday 30 June, Gaza was abuzz with the sudden announcement that Egypt would open Rafah Crossing -- the only gateway for 1.5 million Palestinians who have been imprisoned here for almost two years -- for three short days. Although I had good reasons to use the crossing to leave Gaza, I was unsure about pressing my luck to escape, if only for a short while. Past experience has made me graphically and painfully aware that thousands of my fellow Gazans would also try to capitalize on this very rare opportunity suddenly available to us.On the one hand, I had also already asked my university to add my name to the list of academics who intended to travel to Egypt to further their studies as I had accepted an invitation to a conference -- to be held at University of Brighton -- in London in September. Moreover, I wanted to be with my wife who is in South Africa, and whom I have not seen for almost two years as a result of the siege. On the other hand, the story of failed attempts to leave Gaza through Rafah Crossing is an agonizingly familiar one to every family in Gaza.Nevertheless, the temptation was too great and hope triumphed over experience. At 2pm, on Monday, I called the university's public relations officer. I was told in two short sentences to be at the Rafah crossing at 2am on Tuesday morning. The reason for this strange departure hour was not explained and I did not question it. If one wants to leave Gaza after two years, one simply follows orders.My mind went immediately to the myriad tasks that must be completed in preparation for a journey: money, packing, goodbyes, tickets -- how would all this happen in less than 12 hours? I was not prepared at all and the banks were closed. I allowed myself 10 minutes to think about the steps I should take to ensure that I would be at Rafah Crossing -- 40 kilometers from my home at the end of badly damaged and unlit roads at 2am the next morning. I then remembered that the bank manager is my neighbor; when I called with my unusual request outside of normal banking hours, he was so helpful that getting the money I needed turned out to be the easiest step. I then called my niece to help me pack and prepare for my unexpected journey. Dozens of phone calls were made, but I did not call my wife because I did not want to raise her hopes only to have them dashed as has happened so many times during this siege of Gaza. I, myself, did not have high expectations but I wanted to try because in Gaza one never knows for sure. It could go either way.I made another call to our public relations officer just to find out what I was supposed to do on arrival at the crossing. "Wait with the other academics," was the answer. At around 11pm on Monday night, a colleague called to tell me to delay my departure until morning. His sources at the crossing had informed him that our names were not on the list sent to them by the Egyptians. He suggested I wait for more instructions in the morning. I did not sleep that night. In the morning, I got a call from another colleague, who was also leaving Gaza with me as he had to attend a conference in London. He suggested, on the advice of the public relations officer and another colleague who has contacts on the Palestinian side of the crossing, that we go to Rafah and wait for someone to help us enter the crossing because "our names are on the list. "We left Gaza City at about noon and drove straight to Rafah. Our taxi was stopped by Palestinian policemen at a mobile checkpoint five kilometers before the crossing. We were asked to leave the taxi and wait along with other people. I was encouraged to see only a few people -- perhaps the list was being used and we would be able to leave after all. As it is almost impossible to go anywhere in Gaza without bumping into familiar faces, true to form, I immediately saw my cousin, whose wife has cancer, waving at me. He said he had been at this checkpoint since the night before! Needless to say, this was not good news. My colleague and I then called our friend who has contacts on the Palestinian side. He told us to wait there because one of the policemen at the checkpoint would be informed by his senior to allow us to walk to the crossing. That call never came. Our contact himself then called to get our exact location because he was on his way to fetch us. What relief! Three hours later, we were still waiting and the mobile checkpoint was disbanded. We decided to drive to the crossing itself. That is when reality hit us: tens of thousands of people were waiting there, children, old people, women, and worst of all, terminally ill people, all sitting under the baking hot sun of this semi-desert area. My heart sank! But we had to try our contact again -- how could we not, when the crossing itself was so tantalizingly mere meters away now? And if we passed, what freedoms awaited us: bookshops, movies, theatre, chocolate, friends, fuel, food, fruits and of course, in my case, my long-suffering partner. Our contact gave us more hope by asking us to move closer to the electronic gate and ask a policeman named Bassam to let us in. The next problem on this long journey was trying to reach the gate through the masses of people jealously guarding their spots on the way to the gate. Finally we got to the gate which is where we realized that it would not open for us. The authorities would not open to let a small group of academics through -- list or no list -- simply because the waiting crowd would surge through the gate en masse. In any event we never did find Bassam to open the gate for us.But we waited. The heat became even worse, children cried, and the sick and the elderly sat desperately on the ground -- they could no longer stand and would have to sit on the ground to wait for the gate to open. I decided to join them because it was clear that the wait would be a long one.Worse news was to follow: our names were not on the list -- and the crossing was, in fact, closed! We had to wait outside until somebody allowed us to go inside the Palestinian hall to spend the night there. I was so tired and felt ill. I was also desperate for a toilet as none had been made available to us for all these hours.Next to me was an old woman talking on her cellphone about the pain she was in. Next to her was the family with seven daughters, all on their way to Jordan. Opposite me was an ambulance with a cancer patient -- they had been waiting there for 12 hours. The place was so hot and sticky. After three hours I felt a sudden sharp pain in my stomach; I stood up to lean against the wall while yellow circles danced in front of me and a humming began in my ear. Then, everything went blank. I must have fainted. When I opened my eyes, people were giving me water, chocolate, cheese and asking me to eat and drink. Some pronounced it a diabetic episode, others were convinced it was low blood pressure. I was sure it was sunstroke. Whatever it was, I resolved to go back home right away. On my return home, I was so relieved to see my bed -- and my flat felt like Paradise! That night I wanted to cry; cry for myself, for my dignity; cry for the old woman sitting next to me; cry for my cousin's wife; cry for the patient in the ambulance and for the 50,000 desperate people at the gates of Rafah Crossing.The horror at the crossing continued after I left. Many people spent the entire night there, only to be told the following day that the crossing was still closed and that they should leave. It took me almost two days to feel physically better, but every single muscle of my body still hurts. I am angry and sad and do not have the words to express the depth of my feelings about this experience. The situation that the tens of thousands of Palestinian men, women and children faced at the Rafah border crossing this week was inhumane and unconscionable. Nothing can justify this. Most rushed to Rafah Crossing in as short a time as I did with similar stories of frenzied activity and hope. More than 3,500 of them are terminally ill patients in urgent need of medical treatment in Egyptian hospitals. Others hold residency permits in other countries and have been trapped in Gaza for at least a year. 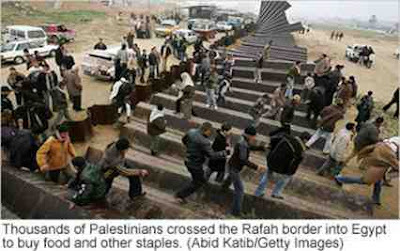 Some are academics and students, traveling abroad to attend conferences or further their studies.So, instead of giving them a chance to do these very ordinary things: go to a hospital, study, go to a conference or work, go back to other homes and other loved ones, the failure to open the Rafah Crossing, instead, increased their misery. Many of them spent three sleepless nights hoping to be allowed to cross into Egypt. Like me, many fainted, or suffered from dehydration and sun stroke. The failure to open Rafah Crossing reminded them of their imprisonment and their lack of human rights; it reminded them that they move at the whim of others and it reminded them that the siege of the Gaza Strip has still not been broken.All the people who were at the Rafah border are civilians. Under the Geneva Conventions they are entitled to freedom of movement and protection fromcollective punishment.During the Cold War, much was made of Checkpoint Charlie as the dividing line: we have a new Checkpoint Charlie today and it is called Rafah Crossing. Haidar Eid is an Associate Professor in Cultural Studies at Al-Aqsa University-Palestine. Not only does Israel do its best not to distribute reparations to Holocaust survivors in need [Watchdog: Treasury delayed funds for survivors], but they do their best to politically exploit the Holocaust. Now it seems they are behaving exactly as they falsely accused Swiss Banks of behaving. Keeping the assets of holocaust survivors from them or their heirs. 'MKs and representatives of Holocaust survivors on Monday harshly criticized a special body established by the government to distribute assets held in Mandatory Palestine by Holocaust survivors and victims. In a Knesset State Control Committee meeting on Monday, it emerged that only 10 heirs of the thousands of Holocaust victims who held such assets have received funds from the Company for Restitution of Holocaust Victims' Assets. The government established the company two years ago in order to expedite the restitution process. 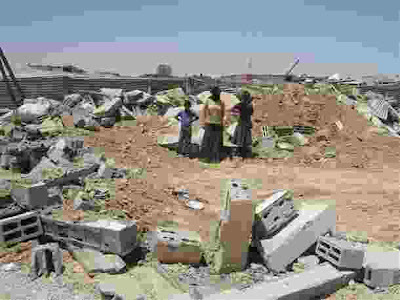 Wednesday morning, July 2nd, 2008, the authorities demolished three homes in the unrecognized village of Wadi al-Na`am in the Negev. The first is a homeof orphans, the second belongs to a married man and his family, and the third is a home of a young man who plans to get married next month. It is important to remember that this village has another problem: Ramat Hovav industrial zone with its dangerous toxic plants, endangers the people`s health. The residents of this village are willing to move to any other place and have been waiting for over ten years for the government tooffer them a suitable alternative. Instead of caring for its Arab-Bedouin citizens and their children, the State of Israel demolishes their homes and takes the almost-nothing they have. Instead if organizing summer camps for the school kids, the state of Israel demolishes their homes leaving them homeless facing the heat of the Negev without a roof over their heads.